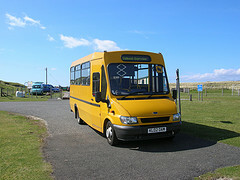 Early this month there was an item on how an American visitor to Rhenigidale travelled on the same school bus and was slightly bemused by the normal attitude of the three schoolchildren on board who paid no attention to him, being understandably absorbed with their smartphone connections. A fourth child, who has often travelled that route, recently volunteered, while undertaking a Duke of Edinburgh Gold Award, for work with the Gatliff Hebridean Hostels Trust, and has gone on to win a scholarship for study in the United States. His observations on fellow-travellers, and their responses to him, on public transport in the remoter areas of the ‘States are awaited.